Some political analysts have suggested that Europeans tend to be more negative in their attitudes towards Israel than Americans, due to the former’s rejection of their colonialist past. The retreating by the British, French, Dutch, Portuguese and Belgians from the colonies that they had established hundred-plus years prior in India, Algeria, Tunisia, Congo, Morocco and other countries, was part of a repositioning of the world back to local sovereignty. The colonialist era has been cast in a racist light and rejected by today’s more “pluralistic” societies. Palestinians have taken note of the change in attitudes, and have adopted new vocabulary to instigate the Europeans against Israel whereby the charges of “colonialist” has accompanied the accusation of being racist. In the 1970s, the head of the Palestinian Liberation Organization, Yasser Arafat, led the world on a venomous attack against “Zionism.” In 1975, Arafat succeeded in getting the United Nations to pass Resolution 3379 condemning “Zionism is Racism.” Somehow, the world became convinced that the national aspirations of Jews to be self-governing was uniquely racist compared to every other nationalistic aspirations. It took sixteen years for the United Nations to erase the charge, but the venom remained in the UN bloodstream. At the UN, the “Question of Palestine” ceased to be a territorial dispute, and became an ethical question for the United Nations: should the global body have created and voted for the Jewish State? Did it do so, solely because of the guilt from the Holocaust? 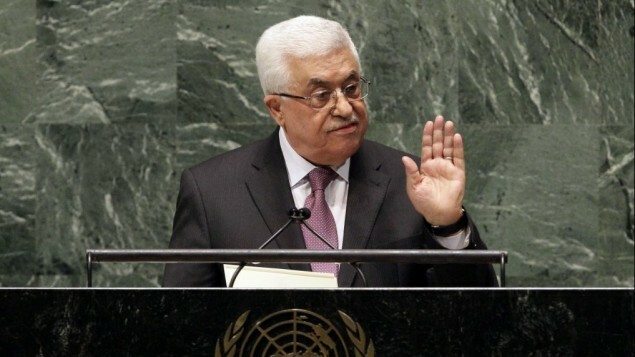 The current acting-President of the Palestinian Authority, Mahmoud Abbas, stokes that question to the mini-inferno that sits in the United Nations today. He constantly uses the term “colonial” to describe the emergence of Israeli “settlements,” and characterizes Israel as a recent foreign transplant on Arab soil. For some of his listeners, the malicious appearance of Israeli Jews began in the “West Bank” in 1967. For others, the Jewish colony overran the entirety of Palestine when the United Nations voted to partition the land into a Jewish State and Arab State in 1947. Somehow, the Europeans and a growing number of countries, have embraced these narratives, particularly that Israel in its entirety was a UN mistake. The clarity of the global adoption of these positions can be found in the annual commemoration of the day of the partition vote on November 29, 1947. The decision to partition Palestine was approved by Jews and rejected by Arabs in 1947, yet the UN specifically chose that date to stand in “solidarity with the Palestinian People.” On its face, it would seem like a cruel decision to create a holiday for a people on the very day that those people despised. However, taken together with the “Zionism is Racism” resolution of 1975, the picture becomes more clear: the UN believed that the decision to partition the land was a mistake. The global body concluded that the Palestinians were correct in the assertion that the UN created a racist, anti-Arab entity in Palestine. The Palestinians were correct to reject the partition plan in 1947. The fault belonged to the United Nations, not the Palestinians, right at creation. The United Nations did not choose June 4 or June 10 as the date to stand together with Palestinians. Those dates in 1967 were the beginning and end of the Six Day War when the Jordanians (together with Palestinians who were then citizens of Jordan) launched an attack on Israel and consequently lost the “West Bank” which they had illegally annexed. If the root cause of the plight of Palestinians was “Israeli settlements” in the West Bank, then those dates would have been more appropriate to anchor the anniversary. But the United Nations wanted to mark its own poor decision. While the Palestinians rejected partition in 1947 and launched wars in 1948 and again in 1967, those bad decisions and actions were not deemed relevant. The UN chose to tell the Palestinians that it was not their fault. Their situation stemmed from decisions that the UN itself made. It is well passed time for Israel to actively combat this claim of colonialization, the way activists overturned the “Zionism is Racism” UN edict in 1991. It is time to clearly educate the world that RE-ESTABLISHING the Jewish State and not banning where Jews can and cannot live is neither colonialist nor racist, but the essence of freedom and justice. This entry was posted in Israel, Middle East Analysis, Palestinians, United Nations and tagged Israel, Mahmoud Abbas, Palestinian Arabs, racism, United Nations by First.One.Through. Bookmark the permalink. As the daughter of Nigerian parents, I am curious about this accusation of colonialism levelled at the Israeli’s. Did the British colonize Nigeria because they were indigenous to the land, having lived there continuously for the last 3500 years? !